Barcelona (AFP) – Catalonia’s separatists weighed their options Sunday ahead of a week that will see Spain take the drastic step of sacking the region’s government as well as calling fresh elections to try and stop the country breaking up. Catalan leader Carles Puigdemont and his regional executive will be booted out, with Madrid taking control of ministries under unprecedented measures announced on Saturday by Prime Minister Mariano Rajoy. “Yesterday there was a fully-fledged coup against Catalan institutions,” said Catalan government spokesman Jordi Turull. Catalan parties are due to meet Monday to organise a full gathering of the regional parliament to debate next steps — a session that could potentially give the ruling separatists another opportunity to declare unilateral independence, which they have been threatening to do since a banned referendum on the issue on October 1. As nearly half a million angry separatists took to the streets of regional capital Barcelona on Saturday, Puigdemont declared Rajoy guilty of “the worst attack on institutions and Catalan people” since the dictatorship of Francisco Franco. Among other repressive measures, Franco — who ruled from 1939 until 1975 — took Catalonia’s powers away and banned official use of the Catalan language. 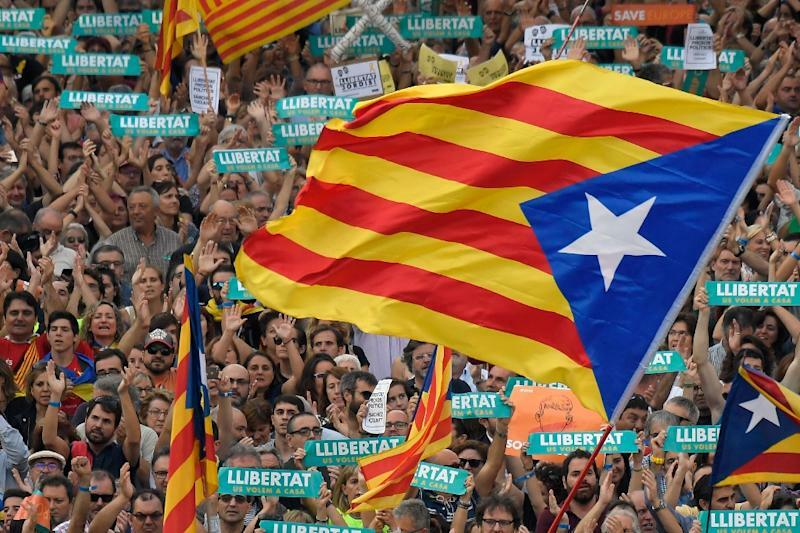 Though Catalans are deeply divided on whether to break away from Spain, autonomy remains a sensitive issue in the northeastern region of 7.5 million people. Catalonia fiercely defends its language and culture and has previously enjoyed control over its policing, education and healthcare. Spain’s government says it had no choice but to use previously untested constitutional powers to seize control of the region, faced with the country’s worst political crisis in decades. “What we are doing is following strictly the provisions of our constitution,” Foreign Minister Alfonso Dastis told BBC television. Madrid could take control of the Catalan police force and replace its public media chiefs, while new elections for the regional parliament must be called within six months. The Senate, where Rajoy’s conservative Popular Party holds a majority and his approach to Catalonia enjoys support from other major parties, is set to approve the measures by the end of the week. But political analysts warn that Madrid faces a serious struggle in practical terms to impose control over the region. Potential scenarios include Catalan police and civil servants refusing to obey orders from central authorities. “What is going to happen if they don’t abide by it?” said Xavier Arbos Marin, a constitutional law professor at the University of Barcelona, raising the prospect of the government trying to “take them out by force”. There is fierce debate among experts over whether the government’s actions are even legal, he added. Independence supporters may also seek to scupper Madrid’s plans through civil disobedience, such as surrounding regional ministries. “If police try to enter one of the Catalan institutions, there will be peaceful resistance,” said Ruben Wagensberg, spokesman for new activist group En Pie de Paz. Antonio Crespo, a 65-year-old retiree who joined a protest in the Spanish capital on Sunday night against Madrid’s takeover, described Rajoy’s decision as “disastrous”. “It’s a huge retreat of freedoms and rights,” he told AFP. Asked if Puigdemont will be arrested if he shows up for work, Spain’s foreign minister tried to strike a reassuring tone. “We are not going to arrest anyone,” Dastis told BBC television, dismissing the idea of the army having to be brought in. But he warned that if Puigdemont’s government keeps trying to give orders, “they will be equal to any group of rebels trying to impose their own arbitrariness on the people of Catalonia”. Puigdemont says 90 percent backed a split from Spain in the referendum, but turnout was given as 43 percent as many anti-independence Catalans stayed away from a vote that was declared illegal by the courts. Opinion polls suggest the wealthy region is evenly split over independence, with separatists saying it pays too much into national coffers but their opponents arguing it is stronger as part of Spain. The crisis has rattled a European Union that is already grappling with Brexit.